This Whirlpool 25 cu. ft. capacity French door refrigerator provides plenty of space to accommodate whatever groceries you may pick up at the store. With the Accu-Chill temperature management system in this ENERGY STAR qualified model, your favorite foods will be stored at the proper temperature without wasting energy through the use of built-in sensors that measure the internal temperature and activates the compressor when needed. Along with the temperature-controlled full-width pantry where you can easily store items as wide as party platters and sheet cakes it is perfectly suited for special occasion events or get-togethers. Cool your food quickly with the Accu-Chill temperature management system. This intuitive system senses and adapts to create the ideal environment for food storage. Store wide items like party platters and sheet cakes or preserve large amounts of meat and cheese with the temperature-controlled full-width pantry. Easily customize door storage by moving these bins when and where you need to. The gallon-size bins can easily accommodate beverage jugs and other larger containers. 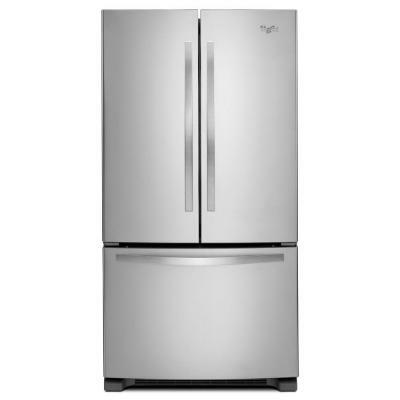 Width with door at 90 degrees:: 43.375"
Depth with door at 90 degrees:: 48.0625"
Drawer Clearance with Handle:: 53.125"
Store: Noble Appliance Center Condition: New (Open Box, or other) Price: $1199.00 Total Price: $1199.00 Buy It from Noble Appliance Center No returns. Last updated: April 18, 2019 at 11:58 EST. Pricing information is provided by the listed merchants. GoSale.com is not responsible for the accuracy of pricing information, product information or the images provided. Product prices and availability is subject to change. Any price and availability information displayed on amazon.com or other merchants at the time of purchase will apply to the purchase of the product. As always, be sure to visit the merchant's site to review and verify product information, price, and shipping costs. GoSale.com is not responsible for the content and opinions contained in customer submitted reviews. Coupon Details: Get $495.10 OFF automatically when you add this item to your cart! Regular price of $1524.10 will be shown prior to adding it to your cart.